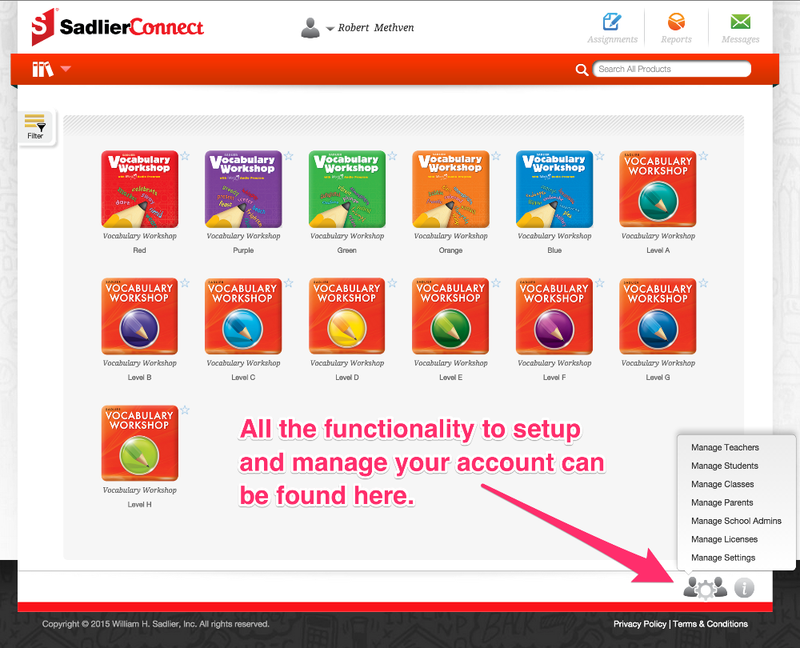 This article outlines the items that you need to complete for your teachers and students to begin to use Sadlier Connect. Log into your Sadlier Connect administrator account. You should have received an email which contains the URL for your school as well as your account information. Once logged in you will access all of the setup functionality at the icon of two people with a gear between them in the lower right-hand corner of your screen. You will need to setup teacher accounts through "Manage Teachers". Here you will be able to "Add Teacher" or import a list of teachers. You can find additional help articles on these topics should you have any questions. You will need to add student accounts through "Manage Students". While one can add students through "Add Student", if you have a bunch of students then it is recommended you do this through the "Import". You will need to create an import file from the template we provide then upload the .CSV file into the system. After teachers and students have been added to the system, you will need to create classes for your teachers through "Manage Classes". In this step you will create classes and associate students to these classes. As with "Managing Teachers" and "Managing Students", this can be done through an import or by creating the classes with the provided web form. (Optional) Creating parent accounts through the "Manage Parents". If you want parents to have their own log in, then you can setup parent accounts for your parents. If you have a product that is site license based, then you have no further steps to setting up your account for teachers and parents to gain access. You just need to provide the users with their account information. If you have products that are seat-based, then you MUST assign the seat-licenses to the individual users for the products to show up in the user's account. This is done through "Manage Licenses". These are the items to complete to setup your account. There are additional articles containing the details on how to do these various setup related tasks. In the event you have questions, you may contact Technical Support through support@sadlierconnect.com or use the "Contact Support" link at the top of this page and we will assist you.